For the past 10 years, IRICoR (Institute for Research in Immunology and Cancer – Commercialization of Research) has targeted the best academia-based projects in order to translate them into innovative therapies that will benefit patients. So far, IRICoR has made close to 80 financings in high-quality projects, established more than 20 strategic partnerships with key players, both locally and internationally, towards initiation of 7 clinical trials in areas of unmet medical needs. 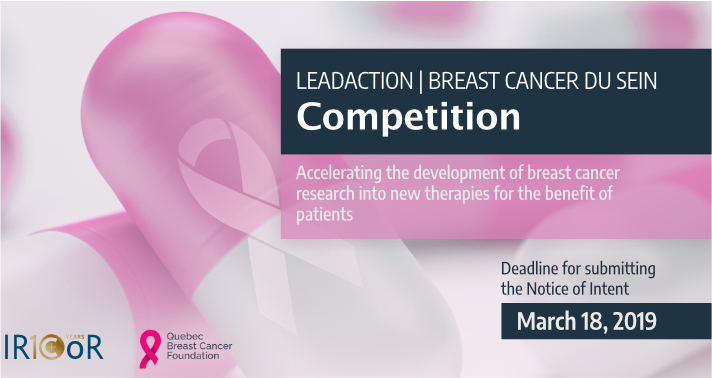 The goal of the Competition is to provide funding for innovative breast cancer research projects in order to accelerate the discovery of new treatments that are accessible to patients. Be situated between the hits to leads transition and pre-clinical studies. 1 in 8 Canadian women will be diagnosed with breast cancer and 1 in 31 will die from it. Men aren’t spared from it either: they account for 1% of all breast cancers. These figures show that it is paramount to continue to advance research, particularly by setting up initiatives such as this Competition. “Hoping to have an impact on the life of women throughout the country, we felt that it was crucial to combine our efforts with a key player like the Quebec Breast Cancer Foundation, which aims to subsidize scientific excellence and accelerate therapeutic innovations in breast cancer for the benefit of patients”, added Nadine Beauger, Chief Executive Officer of IRICoR. For more information, please go to the LeadAction|Breast Cancer du Sein Competition page, here.